We create and wear jewelry because we do not want to feel alone. But “not wanting to feel alone” can mean different things to different people. The jewelry artist must have insight here. 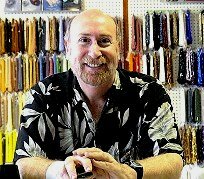 The artist needs to understand what jewelry really is in order to make the kinds of successful choices about forms, materials, design elements, inspirations, techniques, arrangements, public presentations and exhibitions and the like. There are different frameworks from which the artist might draw such understanding, including the sensation of jewelry as OBJECT, CONTENT, INTENT or DIALECTIC. All these lenses share one thing in common – communication. Although jewelry can be described in the absence of communicative interaction, the artist can never begin to truly understand what jewelry really is without some knowledge about its creation and without somehow referencing the artist, the wearer, the viewer and the context. Simply put, we create and wear jewelry because we do not want to feel alone. But “not wanting to feel alone” can mean different things to different people. The jewelry designer, in order to make the best choices and the most strategic choices throughout the process of designing a piece of jewelry, requires some detail and clarity here. What does it mean to say that we create and wear jewelry so we do not want to feel alone? We might want to reaffirm that we are similar (or different) than someone else or some other group or culture. We might want to signal some connection (or disconnection or mal-connection) with a higher power or mystical source or sense of well-being or with some idea, concept or meaning. We might want to express an intent or feeling or emotion. We might want to differentiate what it means to be yourself relative to something else, whether animate or inanimate, functional or artistic, part of a dialectic conversation with self or other. We might want to signal or differentiate status, intelligence, awareness, and resolution. We might want to separate ourselves from that which is sacred and that which is profane. Whatever the situation, jewelry becomes something more than simple decoration or adornment. It becomes more than an object which is worn merely because this is something that we do. It becomes more than a functional object used to hold things together. It is communicative. It is connective. It is intentional. And concurrently, it must be functional and appealing and be seen as the result of an artist’s application of technique and technology. The word jewelry derives from the Latin “jocale” meaning plaything. It is traditionally defined as a personal adornment or decoration. It is usually assumed to be constructed from durable items, though exceptions are often made for the use of real flowers. It is usually made up of materials that have some perceived value. It can be used to adorn nearly every part of the body. One of the earliest evidences of jewelry was that of a Neanderthal man some 115,000 years ago. What was it – and we really need to think about this and think this through – which made him craft the piece of jewelry and want to wear it? Mere decoration? Did it represent some kind of status? Or religious belief? Or position or role? Or sexuality and sensuality? Or was it symbolic of something else? 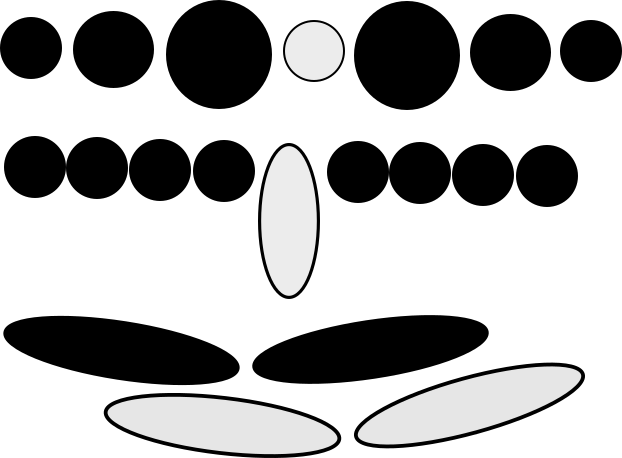 Was this a simplified form or representation of something else? Did this Neanderthal have concerns about craft and technique? Did the making of it require some special or innovative technology? Did the cost of materials come into play? Was this an expression of art? Self? Power? A show of intelligence and prowess? A confirmation of shared beliefs, experiences and values? Was it something he made himself, or was it something given to him as a gift or token of recognition? Picture yourself there at this very moment. What happened at the point this Neanderthal man put this piece of jewelry on? Did this reduce or increase social and cultural barriers between himself and others? Did this define a new way of expression or a new way of defining the self? Did this impact or change any kind of outcome? Did this represent a divergence between craft and art? Was this piece of jewelry something that had to be worn all the time? 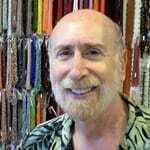 Were the purposes and experiences of this Neanderthal man similar to why and how we design and adorn ourselves with jewelry today? We know that jewelry continued in importance. Jewelry mattered. It was an object we touched. And it was an object we allowed to touch our bodies. The object had form. The form encapsulated meaning. We allowed others to view the jewelry as we wore it, and when we did not. 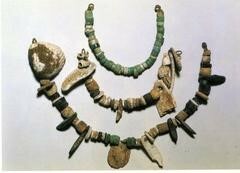 Making and wearing jewelry became very widespread about 5,000 years ago, especially in India and Mesopotamia, but worldwide as well. While some cultures banned jewelry or limited its forms and uses (see medieval Japan or ancient Rome, for example), they could not maintain these restrictions over time. People want to support the making of jewelry, the wearing of it, the exhibiting of it in public, and the accumulating of it. People want to touch it. Display it. Comment about it. Talk about it with others. Collect it, trade it, buy it, sell it. As jewelry designers, we need to understand the why’s … Why make jewelry at all? Why develop different techniques and use different materials and come up with different arrangements? We observe that jewelry is everywhere, worn by all types of people, on various parts of the body, in many different kinds of situations. Jewelry must possess a kind of inherent value for the artist, the wearer, the viewer and the society as a whole. So we have to continue to wonder, Why is jewelry so coveted universally? Why is it important? How is understanding what jewelry is really necessary for making the kinds of successful choices about forms, materials, design elements, inspirations, techniques, arrangements, public presentations and exhibitions and the like? Yet, no matter what the framework we use to try to makes sense about what jewelry really is, all these lenses share one thing in common – jewelry is more than ornament and decoration; it is communication, as well.Although we can describe jewelry in the absence of knowledge about its creation, we cannot begin to understand what jewelry really is without somehow referencing the artist, the wearer, the viewer and the context. Too often, ideas about communication and meaning and intent get too messy and complicated. We seek a simpler framework within which to understand what jewelry is all about. We try to fit the idea of jewelry into the confines of a box we call “object”. It is decoration. Jewelry succeeds as “object” to the extent that everyone everywhere universally agrees to what it is, how it is made, what it is made from, why it was made, and in what ways it is used. Jewelry As Something That We Do. Wearing jewelry might simply be something that we do. We put on earrings. We slip a ring onto a finger. 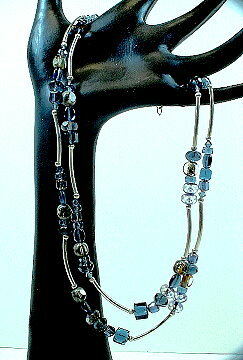 We clasp a necklace around our neck or a bracelet around our wrist. It is habit. Routine. Not something to stop and ask why. A necklace is a necklace. An earring is an earring. We mechanically interact with decorative objects we call jewelry. Jewelry As A Material. Sometimes we want to get a little more specific and describe what this object or ‘box’ is made of. It is some kind of material. Jewelry encompasses all types of stones and metals, in various shades and colors, which the artist has taken tools to them to shape and sharpen. Sometimes we want to further delineate the character of materials within and around this box. We refer to this as selecting various design elements such as color, pattern, texture. Jewelry As Arrangements and Forms. Sometimes we want to even further elaborate on our placement in terms of Principles of Composition which refers to arrangements and organized forms to create movement, rhythm, focal point, balance, distribution. We apply this framework in a static way. 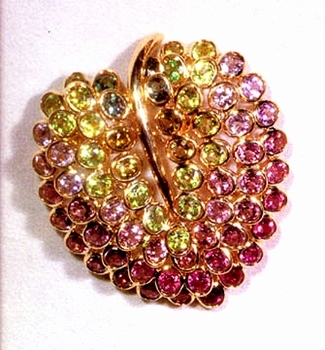 Jewelry is reduced to an object, somehow apart from its creator and disconnected from any wearer or viewer. Jewelry As The Application of Technique(s). We can also understand jewelry as object in a more dynamic sense. It is something which is created by the application of one or more techniques. The techniques are applications of ideas often corralled into routines. The object is seen to evolve from a starting point to a finishing point. 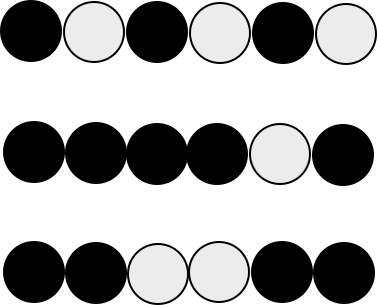 As object, it is reduced to a series of organized steps. These steps are disconnected from insight, inspiration, aspiration or desire. There is no human governance or interference. Jewelry As Function. 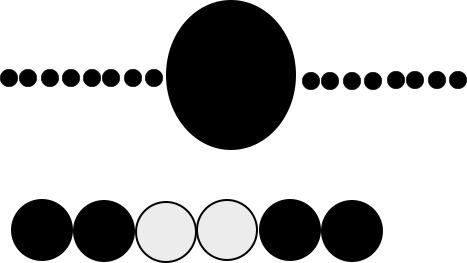 In a similar dynamic way, the object may be seen to have function. It may hold up something, or keep something closed. It may, in a decorative sense, embellish a piece of clothing. It may assist in the movement of something else. It is not understood to have any meaning beyond its function. As it coordinates the requirements of form to the requirements of function, it plays a supportive, practical role, not a substantive role. As such, it is unimportant. 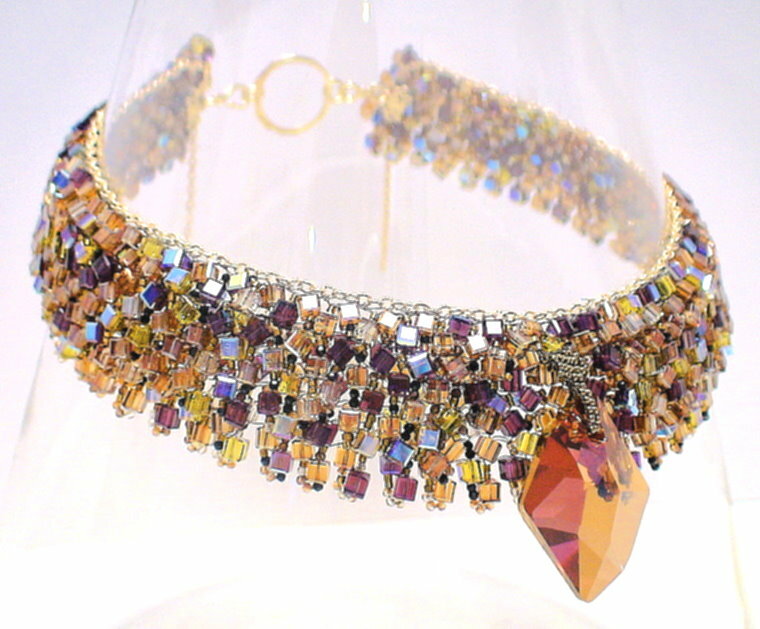 It might allow the wearer to change position of the necklace on the neck. It might better enable the piece to move with the body. But it should not demand much insight or reflection by creator, wearer, or viewer. However, as we get closer to defining the object as one that is sensed and experienced and which evokes an emotional response, it becomes more difficult to maintain that the object does not reflect meaning, does not result from some kind of thought process and intent, and does not communicate quite a lot about the designer, the wearer, the viewer and the situation. Jewelry when worn and which succeeds becomes a sort of identifier or locator, that can inform the wearer and the viewer about particular qualities or content, such as where you belong, or what you are about, or what your needs are. Jewelry without content, after all, can skew to the superficial, boring, monotonous and unsatisfying. Without meaning and value, jewelry has little to offer. Jewelry As Meaning. Jewelry when worn signals, signifies or symbolizes something else. It is a type of recognizable short-hand. It is a powerful language of definition and expression. By representing meaning, it takes responsibility for instigating shared understandings, such as membership in a group or delineating the good from the bad. It might summarize difficult to express concepts or emotions, such as God, love, loyalty, fidelity. It might be a stand-in marker for status, power, wealth, connection and commitment. It might visually represent the completion or fulfillment of a rite of passage – puberty, adulthood, marriage, birthing, and death. Sometimes, the sensation of jewelry as meaning derives from energy and powers we believe can transfer from the meaning of the materials the jewelry is made of to ourselves. These might be good luck, or good fortune, or good health, or good love, or good faith or protection from harm. Various gemstones, metals and other materials are seen to have mystical, magical and supernatural qualities that, when touching the body, allows us to incorporate these powers with our own. Jewelry As Value. When we refer to meaning as having power, sacredness, respect, significance, we are beginning to assign a value to it. A sensation of value may emerge from how rare the item is – its material rarity or the rarity of how it was constructed or where it came from or who made it or who was allowed to wear it. It may emerge from how bright it is or the noteworthy arrangement of its elements. Its value may emerge from how pliable or workable the material is. Its value might be set from how tradable it is for other materials, objects, access or activities. By assigning value, we determine things like importance, uniqueness, appeal, status, need, want, and demand. We establish control over how and how often a piece of jewelry will change hands. We establish some regulation over how individuals in a group, culture or society interact and transact with one another. Someone has to infuse the object with all this content, and this proactive act leads us to the idea of intent. Often this imposition of meaning begins with the jewelry artist. Jewelry becomes a means of self-expression. The artist, in effect, tells the world who the artist is, and what the artist wants to happen next. The artist might be subdued or bold, colorful or monochromatic, simple or complex, extravagant or economical. The artist might be direct or indirect in how meanings get communicated. It is important, in order to understand the meaning of an object, to begin by delineating the artist’s inspiration, aspiration and intent. The jewelry artist begins with nothing and creates something. The unknown, the unknowable, the nothingness is made more accessible. The artist fills in a negative space with points, lines, planes, shapes, forms and themes. Color, pattern and texture are added. Things get organized and arranged. Though often unstated, it becomes obvious that of all the possible choices the artist could have made in design, that some choices were ignored and excluded, while others were not. The question becomes, what influences that artist’s selections? Successful jewelry reveals the artist’s hand. Jewelry As Creating Order Out Of Chaos. Partly, what the artist does is attempt to order the world. The artist looks for clues within him- or herself (inspiration and intent). The artist formulates concepts and a plan for translating inspiration and intent into a design. The artist determines whether to take into account the expectations of others (shared understandings) about what would be judged as finished and successful. Jewelry is an object created out of chaos and which has an order to it. The order has content, meaning and value. It has coherency based on color and texture and arrangement. Jewelry as an organized, ordered, coherent object reflects the hypotheses the artist comes up with about how to translate inspiration into aspiration, and do this in such a way that the derived jewelry is judged positively. The artist anticipates how others might experience and sense the object on an emotional level. It reflects the shared understandings among artist, wearer and viewer about emotions, desires, inherent tensions and yearnings and how these play out in everyday life. The artist makes the ordered chaos more coherent, and this coherence becomes contagious through the artist’s choices about creative production and design. The artist lets this contagion spread. To the extent that others share the artist’s ideas about coherence, the more likely the work will be judged finished and successful. And no one – not the artist, not the wearer, not the viewer – will feel alone. The process of bringing order to chaos continues with the wearer. The wearer introduces the piece of jewelry into a larger context. We have more contagion. The jewelry as worn causes more, ever-expanding tension and efforts at balance and resolution. There is an effort to figure out the original artist intent and ideas about coherence as reflected in design. Unsuccessful efforts at design, where the artist’s intent becomes obscured, reverse the process, and the object – our piece of jewelry – then brings about decoherence. Decoherence may come in the forms of bad feedback, inappropriate feedback, less than satisfying feedback, or no feedback at all. Decoherence means the wearer may not get that sense of self s/he seeks. S/he may feel less motivated to wear the piece. S/he may store the piece or give the piece away. As this decoherence filters down to the level of the artist, any necessary support in design may be lost. There will be fewer clients, fewer opportunities to display the works publicly, and fewer sales. The artist’s motivation may diminish. Jewelry As An Agent of Personality. People wear jewelry because they like it. It becomes an extension of themselves. It is self-confirming, self-identifying and self-reconfirming. Liking a piece of jewelry gets equated with liking oneself, or as a strategy for getting others to express their like for you. Jewelry makes us feel more like ourselves. We might use jewelry to help us feel emotionally independent, or we might come to rely on jewelry for emotional support and feedback, leading us down the path to emotional dependency. Jewelry may have personal significance, linking one to their past, or one to their family, or one to their group. It may be a way to integrate history with the present. It is a tool to help us satisfy our need to affiliate. Jewelry may help us differentiate ourselves from others. It may assist us in standing out from the crowds. Conversely, we may use it to blend into those multitudes, as well. Jewelry fulfills our needs. If we look at Maslow’s Hierarchy of Needs, after meeting our basic physiological needs such as for food and water, and our safety needs, such as for shelter, we can turn to jewelry to meet our additional social needs for love and belonging and self-esteem. Designing and creating jewelry can form an additional basis for our needs for self-actualization. We may derive our personality and sense of soul and spirit from the qualities we assign the jewelry we wear. 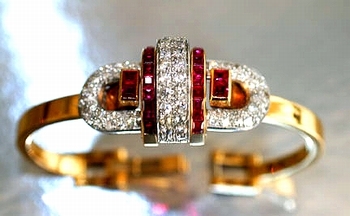 If ruby jewelry symbolizes passion, we may feel passion when wearing it. We may use jewelry as an expressive display of who we feel we are and want to be seen as in order to attract mates and sexual partners. We use jewelry in a narcissistic way to influence the alignment of the interests and desires among artist, weaver, viewer, collector, exhibiter, and seller. In similar ways, we may derive our sense of belief, devotion and faith to a higher power or spiritual being or God from wearing jewelry. It may help us feel more connected to that religious, spiritual something within ourselves. It may remind us to stay on our religious path. As an agent of our psychological selves, jewelry is used to resolve those core conflicts – Who are we? Why do we exist? How should we relate to other people around us? Jewelry orients us in coming to grips with our self-perceived place within critical contradictions around us. Trust and mistrust. Living and dying. Good and evil. Pleasure and pain. Permission and denial. Love and hate. Experience and expectation. Traditional and contemporary. Rational and reasonable. Jewelry is a two-way street. It is a way to create, confirm and retain connections. At its very core, it is communicative. It is more an action than an object. Jewelry can start a conversation. Jewelry encapsulates a very public, ongoing matrix of choices and interactions among artist, wearer and viewer, with the purpose of getting responses. It is a dialectic. The optimum position to view jewelry is on a person’s body, where and when its dialectical power is greatest. Again, it is very public, yet concurrently, very intimate. We exhibit jewelry. It forces reaction, response and reciprocity. Jewelry helps us negotiate, in relatively non-threatening ways, those critical tensions and contradictions in life, not merely define them. It very publicly forces us to reveal our values, delineate tensions and contradictions which might result, and resolve all those betwixt and between qualities which occur as the artist, wearer, viewer, marketer, seller, exhibitor and collector try to make sense of it all. Conversely, jewelry, as worn, may signal that any negotiation would be futile, but this is a dialectic, communicative act, as well. Jewelry expresses or implies things, the relevance of which emerges through interactions. There is an exchange of meaning. There is some reciprocity between the artist expressing an inspiration with the desire for a reaction, and the wearer evaluating the success of the piece and impacting the artist, in return. Jewelry is persuasive. It allows for the negotiation of influence and power in subtle, often soft-pedalled ways. It helps smooth the way for support or control. Compliance or challenge. Wealth and success or poverty and failure. High or low status. Social recognition. An expression of who you know, and who might know you. Jewelry is a tool for managing the dynamics between any two people. Jewelry is emotional and feeling, with attempts by the artist to direct these, and with opportunities for others to experience these. It is not that we react emotionally to the beauty of an object. It is not mechanical or fleeting. It is more of a dialectic. The jewelry is an expression of an artist’s inspiration and intent. We react emotionally to what we sense as that expression as it resonates from the object itself. This resonance ebbs and flows, waxes and wanes, over time as the object is worn in many different situations. Jewelry draws attention. It becomes a virtual contract between artist and wearer. The artist agrees to design something that will call attention to the wearer and that wearer’s preferred sense of self. The wearer agrees to wear something that reaffirms the artist’s insights for all to witness and experience and draw support. Jewelry may cue the rules for sexual and sensual interactions. Nurturing and desire. Necklaces draw attention to the breasts. Earrings to the ear and neck. Rings to the hands. Jewelry, such as a wedding band, may confirm a relationship, and signal permission for various forms of touching that otherwise would not be appropriate. The silhouettes and placements of jewelry on the body indicate where it may be appropriate for the viewer to place his gaze, and where it would not. 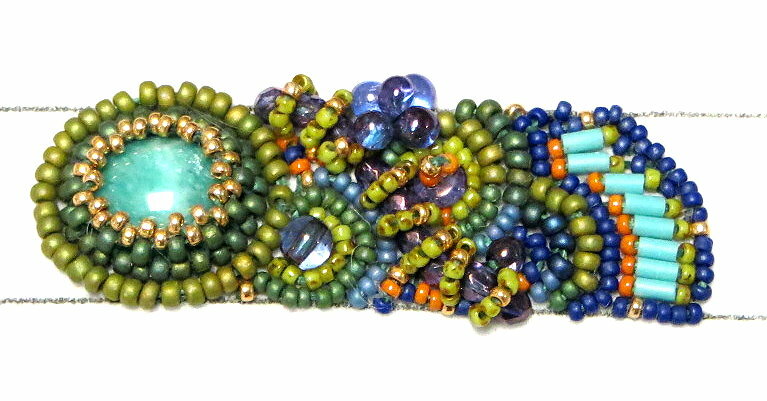 Knowing what jewelry really is better connects the artist to the various audiences the artist seeks to reach. It results in better outcomes. More exhibits. More sales. More collections. Better self-esteem. Better representation of self in various contexts and situations. Jewelry asks the artist, the wearer and the viewer to participate in its existence. In a somewhat subtle way, by allowing communication, dialog, evaluation, and emotion, jewelry allows each one not to feel alone. It allows each one to express intent, establish a sense of self, and introduce these intents and self-expressions into a larger social context. Jewelry judged as finished and successful results from these shared understandings among artist, viewer and wearer, and how these influence their subsequent choices. These choices extend to materials and arrangements. They extend to how the artist determines what is to be achieved, and how the work is talked about and presented to others. These anticipate the reactions of others, beliefs about saleability, assumptions about possible inclusions in exhibitions, knowing what is appealing or collectible. 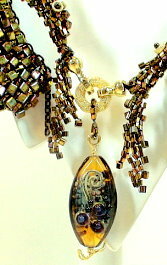 The artist is always omnipresent in the jewelry s/he creates. The artist, through the jewelry, and how it is worn on the body, to some extent, arbitrates how other sets of relationships interact, transfer feelings, ideas and emotions, reduce ambiguity, influence one another, and make sense of the world around them. In the abstract, jewelry is a simple object. We make it. We wear it. We sell it. We exhibit it. We collect it. But in reality, jewelry channels all the artist’s and wearer’s and viewer’s energy – the creative sparks, the tensions, the worries, the aspirations, the representations, the assessments of risks and rewards, the anticipations of influence and affect. Jewelry becomes the touchstone for all these relationships. It is transformational. It is a manifestation of their internal worlds. An essence resonant in context. The better jewelry designer is one who anticipates these shared understandings about what makes a piece of jewelry finished and successful, and can incorporate these understandings within the jewelry design process s/he undertakes. Grosz, Stephen, The Examined Life: How We Lose and Find Ourselves, NY: W.W.Norton & Company, 2014. Contemporary Jewelry represents a specific approach for thinking through design. Making jewelry is, in essence, an authentic performance task. The jewelry artisan applies knowledge, skill and awareness within the anticipation of the influence and constraints of a set of shared understandings. Shared understandings relate to composition, construction and performance. These understandings are enduring, transferable, big ideas at the heart of what we think of as “contemporary jewelry”. They are things which spark meaningful connections between designer and materials, designer and techniques, and designer and client. Managing these connections is what we call “fluency in design”. 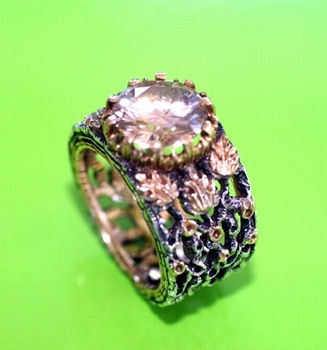 Jewelry Design is a professional discipline. Every legitimately defined profession has at its core a discipline-specific way of thinking. This includes core concepts, core rules, and core beliefs. And it includes professional routines and strategies for applying, manipulating and managing these. The good designer is fluent in how to think through design, and the good contemporary designer is fluent in how to think through design which earns the label “contemporary”. But, the jewelry designer can only wonder at this with crossed eyes and bewilderment. As a profession, jewelry design balances a series of contradictions, most notably to what extent the practice is craft, art or design. This works against professional legitimacy. Jewelry Design, as a discipline, is not always clear and consistent about its own literacy – that is, what it means to be fluent in design. Its core concepts, rules and beliefs are not well-defined, and often break down by medium, by operational location – (visualize museum, gallery, studio, store, factory, workshop, class, home), and by the degree of involvement and commitment to the profession of the jewelry designer him- or herself. The diversity of materials, approaches, styles and the like make it difficult to delineate any unifying principles or professional image. As designers, we see, feel and experience the evolving dynamics of an occupation in search of a profession. But our profession is still in search of a coherent identify. Perhaps we see this most often in debates over how we come to recognize what jewelry we think should be labeled “contemporary” and what jewelry should not. On the one hand, the idea of contemporary can be very elucidating. On the other, however, we are not sure what contemporary involves, how the label should be applied, and what the label represents. Yet, our sense-making search for its meaning is at the forefront of the professionalization of jewelry design. Our persistent questioning about “What is contemporary jewelry?” opens up thinking and possibilities for every jewelry designer, working across many styles and with many materials, both experienced and novice alike. The term “contemporary” is defined as something occurring in our time, and that can be very confusing for the jewelry designer. We get caught in a major Identity Crisis for lack of a clear, agreed-upon definition of contemporary. How we resolve this Identity Crisis around a common understanding of “contemporary jewelry” can go a long way, I believe, towards developing a coherent disciplinary literacy and professional identity for all jewelry designers. Resolution can be very unifying. Many conceptual questions about contemporary jewelry arise. We need to be very cognizant of how we think through our responses. Does the label apply to every piece of jewelry made today? We see all kinds of styles, shapes, silhouettes, materials, techniques, fashions all around us. There appears to be no common denominator except that they all have been created in our time. Should the label be applied to all this variation? Why would we want it to? Does the label apply to a certain timeframe, with the expectation that it will be supplanted by another label sometime in the future? I suggest that contemporary jewelry is not a specific thing. But rather it is a way of thinking through the design process. It is a type of thinking routine which underlays the universal core of contemporary jewelry design. Contemporary jewelry is not every piece of jewelry made in our time. It is, instead, jewelry designed and crafted with certain shared understandings in mind – understandings about composition, construction and performance. Contemporary jewelry is not associated with any particular color or pattern or texture. It is, instead, a strategy for selecting colors, patterns and textures. 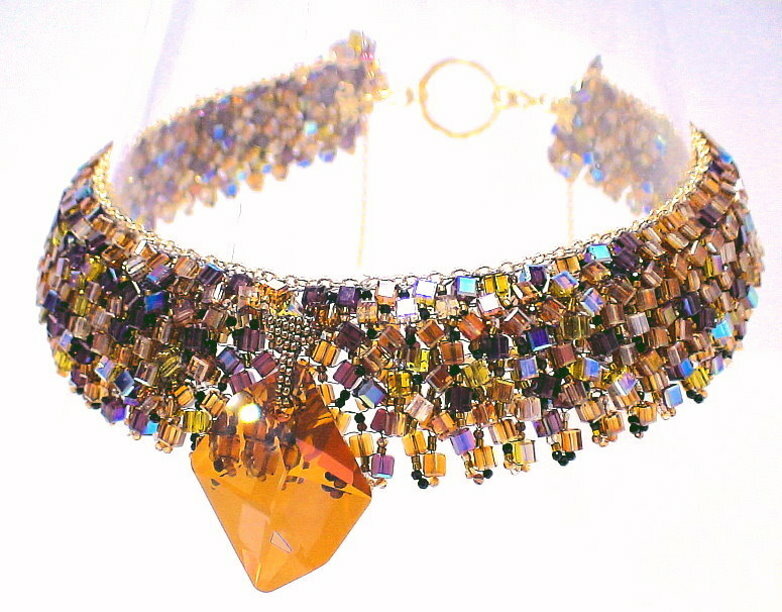 Contemporary jewelry is not something that only a few people would make or wear, whether boring or outlandish. It is, instead, something most people recognize as wearable with some level of appeal. 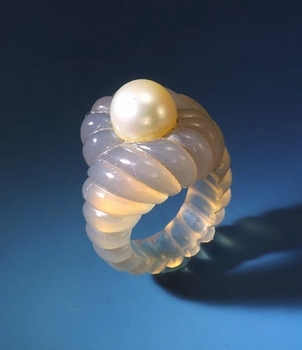 Contemporary jewelry is not restricted to the use of unusual or unexpected materials or techniques. It is, instead, something which leverages the strengths or minimizes the weaknesses of any and all materials and/or techniques used in a project. Contemporary jewelry is not a specific silhouette, or line, or shape, or form, or theme, but, instead, something which shows the artist’s control over how these can be manipulated, used, played off of, and, even, violated. Contemporary jewelry is an integral part of our culture. We wear jewelry to tell ourselves and to tell others we are OK. It is reflective of the sum of all our choices about how we think through our place among others, our relative value among others, our behaviors among others, our preferred ways to interact, challenge, conform, question, organize and arrange. The contemporary jewelry designer is especially positioned to serve at the nexus of all this culture. The designer’s ability to think through and define what contemporary means becomes instrumental for everyone wearing their jewelry to successfully negotiate the day-to-day cultural demands of the community they live in. Designers have a unique ability to dignify and make people feel valued, respected, honored and seen. Think of all that power! Each person stands at that precipice of acceptance or not, relevance or not. The jewelry designer has the power to push someone in one direction, or another. If only we had the established profession and a disciplinary literacy to help us be smart about this. Jewelry design is, in effect, an authentic performance task. 1. Work within our shared understandings about contemporary jewelry. 2. 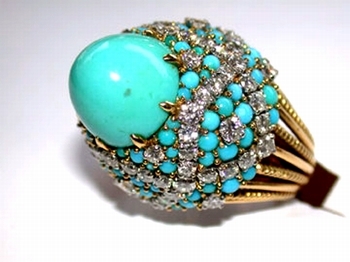 Apply key knowledge and skills to achieve the desired result – a contemporary piece of jewelry. 3. Anticipate how their work will be reviewed, judged and evaluated by criteria reflective of these same shared understandings. 4. Step back, reflect, and validate all their thinking to reject any misunderstandings, and make adjustments accordingly. The better designer is able to bring a high level of coherence and consistency to the process of managing all this – shared understandings, knowledge and skills, evaluative review, and reflection and adjustment. This is called “fluency in design”. Shared understandings should be enduring, transferable, big ideas at the heart of what we think of as contemporary jewelry. These shared understandings are things which spark meaningful connections between designer and materials, designer and techniques, and designer and client. We need, however, to recognize that the idea of understanding is very multidimensional and complicated. Understanding is not one achievement, but more the result of several loosely organized choices. Understanding is revealed through performance and evidence. Jewelry designers must perform effectively with knowledge, insight, wisdom and skill to convince us – the world at large and the client in particular — that they really understand what design, and with our case here, contemporary design, is all about. 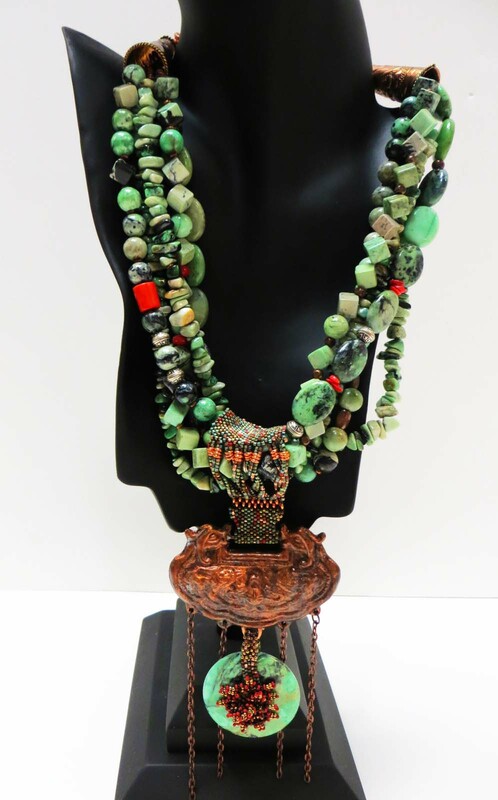 This involves a big interpersonal component where the artist introduces their jewelry to a wider audience and subjects it to psychological, social, cultural, and economic assessment. Understanding is more than knowledge. The designer may be able to articulate what needs to be done to achieve something labeled contemporary, but may not know how to apply it. Understanding is more than interpretation. The designer may be able to explain how a piece was constructed and conformed to ideas about contemporary, but this does not necessarily account for the significance of the results. Understanding is more than applying principles of construction. It is more than simply organizing a set of design elements into an arrangement. The designer must match knowledge and interpretation about contemporary to the context. Application is a context-dependent skill. Understanding is more than perspective. The designer works within a myriad of expectations and points of view about contemporary jewelry. The designer must dispassionately anticipate these various perspectives about contemporary design, and, bring some constructed point of view and knowledge of implications to bear within the design and design process. Last, understanding is self-knowledge, as well. The designer should have the self-knowledge, wisdom and insights to know how their own patterns of thought may inform, as well as prejudice, their understandings of contemporary design. How the jewelry designer begins the process of creating a contemporary piece of jewelry is very revealing about the potential for success. The designer should always begin the process by articulating the essential shared understandings against which their work will be evaluated and judged. For now, let’s refer to this as Backwards Design. The designer starts with questions about assessment, and then allows this understanding to influence all other choices going forward. When designing contemporary jewelry, the designer will push for shared understandings about what it means to be worthy of the label “contemporary.” I propose the following five shared understandings as a place to start, and hopefully, to generate more discussion and debate. 1. Fixed Frameworks and Rules should not pre-determine what designers do. Rules do exist, such as color schemes or rules for achieving balance or rhythm. But rules may be challenged or serve as guidelines for the designer. In fact, the designer may develop and implement rules of their own. Designers do not learn understanding if they are only able to answer a question if framed in one particular way. How the designer invents and applies rules for managing design as a process become of primary importance because they reveal design fluency and thinking. And this allows for a variety of approaches as well as an escape from any dominant definitions. Nothing is sacred. 2. Jewelry should extend, rework, and play with, or even push, the boundaries of materials, techniques and technologies. Contemporary designers are meant to ask questions, evaluate different options and experiment widely. They do this in order to leverage the strengths and minimize the weaknesses of materials, techniques and technologies used. Their jewelry should reflect this. 3. Jewelry should evoke emotions. The audience is an integral part of the success of contemporary jewelry. The viewer/wearer recognizes things in the piece and is allowed to, (in fact, expected to), react and interpret. The designer’s goal is to achieve a level of resonance. 4. Jewelry should connect people with culture. Contemporary jewelry is not made for art’s sake alone. Contemporary jewelry is made to connect to the world around us. It is meant to assist a person in recognizing how they want to live their lives, and how they want to introduce their view of themselves into the broader community or communities they live in. 5. 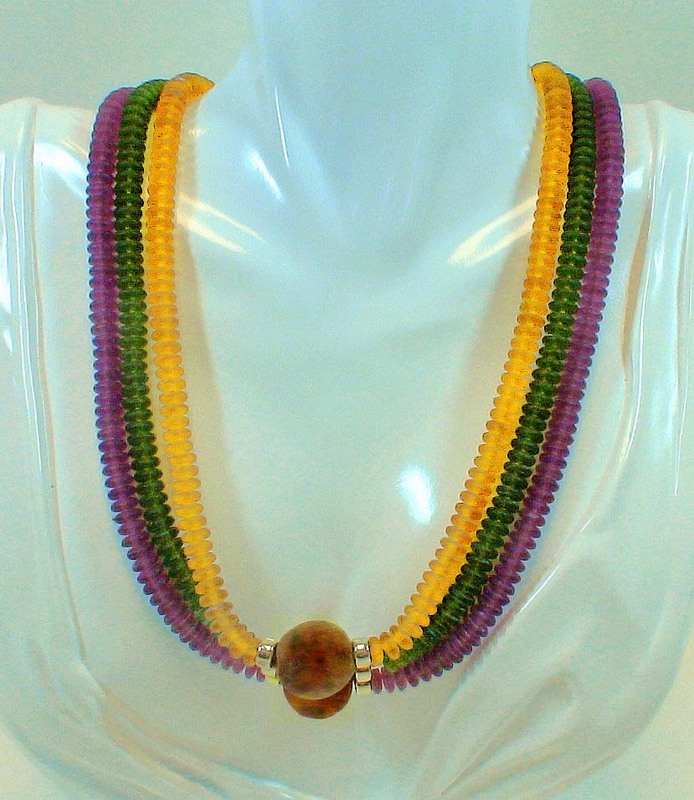 Successful jewelry designs should only be judged as the jewelry is worn. Jewelry is not designed in isolation from the human body. Its design should anticipate requirements for movement, drape and flow. Its design should anticipate the implications of the context in which the jewelry is worn. The implications for all jewelry design choices are most apparent at the boundary between jewelry and person. The designer determines (a) what design elements to include in the piece, and then (b) rules for manipulating them. The contemporary designer (c) measures these against our shared understandings about contemporary design. These measures are a continuum – degrees of contemporary, not either/or’s or absolutes. In any given piece of jewelry, some design elements may be very contemporary, and others might not. Jewelry making is a constructive process. It makes sense for the designer to begin with something like building blocks, which I call design elements. Design elements include things like color, movement, dimensionality, materials, use of space, and the like. 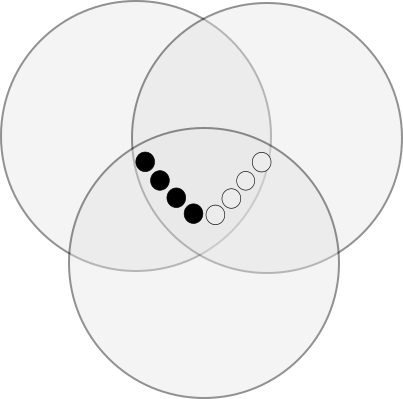 Each design element, in turn, encompasses a range of acceptable meanings, yet still reflective of that design element, and which are called attributes. These design elements can be arranged in different configurations. The combination of any two or more design elements can have synergistic effects. Working with design elements is not much different than working with an alphabet. An alphabet is made up of different letters. Each letter has different attributes – how it is written, how it sounds, how it is used. Configurations of letters result in more sounds and more meanings and more ways to be used. A person working with an alphabet has to be able to decode the letters, sounds and meanings, as letters are used individually as well as in combination. 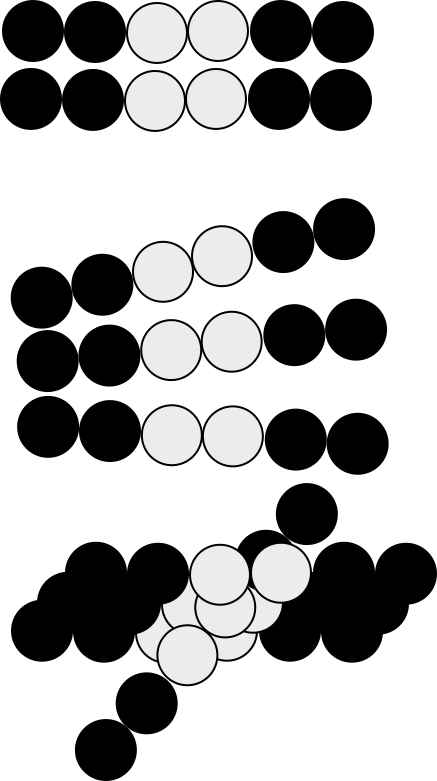 As the speaker becomes better at decoding, she or he begins to build in understanding of implications for how any letter is used, again, individually or in combination. This is exactly what the jewelry designer does with design elements. The designer has to decode, that is, make sense of a series of elements and their attributes in light of our shared understandings about jewelry design. The contemporary designer decodes in light of our further shared understandings about contemporary jewelry design. The designer might, for example, want to select from this list of design elements I have generated below. I have arranged these design elements into what is called a thinking routine. The designer uses the routine to determine how each element might be incorporated into the piece, and how the desired attributes of each element relate to contemporary design. They might also use the routine to look for issues of true and false. They might use the routine to rate each element as to importance and uncertainty. What are some things which make this piece “Contemporary”? Dimensionality Two layers of beadwork. The top layer overlapping the bottom layer, where the first row of the bottom layer is attached to the 2nd row of the top layer, forcing a curvature along the top. The pendant sits on top of bottom layer and in line with top layer. Moving Elements The two layers are only connected at their tops. As the wearer moves, each layer can move somewhat independently of the other. Color, Color Blending The piece uses a 5-color scheme, but increases the natural proportions of one color relative to the others. 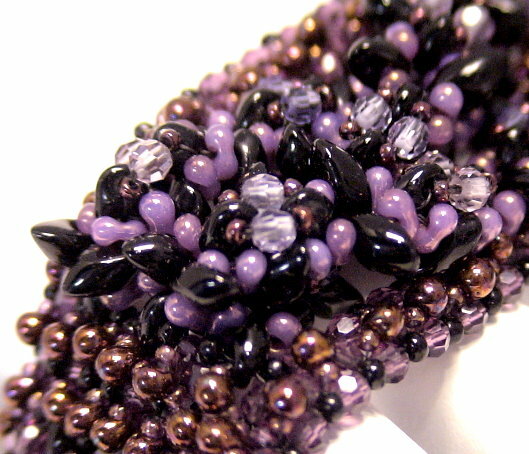 There are many gaps of light between all the beads which calls for a color blending strategy(ies). The piece relies heavily on simultaneity effects, as well as the overlapping effects of transparent and translucent beads. Technique(s) The bead woven strips are allowed to fan out from the top, thus better accommodating the wearer’s body. Design elements need to be selected, organized and implemented in some kind of satisfying design. Towards this end, the artist, consciously or not, anticipates our shared understandings in order to make these kinds of choices. These are the most visible choices the artist makes. We can see the finished piece of jewelry. We interact with it. We question it. We get a sense of whether we want to emotionally respond to it. We either feel its resonance, or we don’t. Most artists manage intuitively, learning to make good choices as they receive feedback and assessment, and adjust their decisions accordingly. 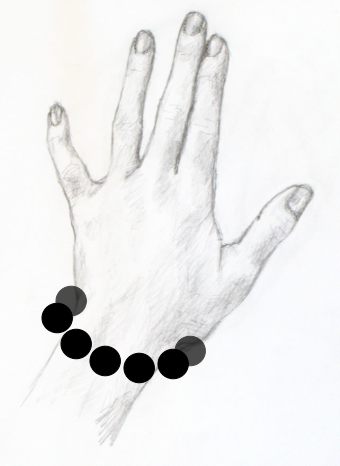 The better jewelry designers, however, show “metacognitive awareness” of all the things they have thought of, anticipated, structured, and accomplished during the design process as these relate to larger shared understandings about contemporary jewelry. Let’s return, for a minute, to the analogy with building blocks and the alphabet. The design elements are building blocks. I compared them to the letters of the alphabet. Building blocks have attributes, and letters have attributes. Attributes further define them and give them purpose. The novice designer learns to decode these building blocks and their attributes. With more experience, the blocks, just like letters, get combined and constructed into words and phrases and larger, meaningful ideas and expressions. 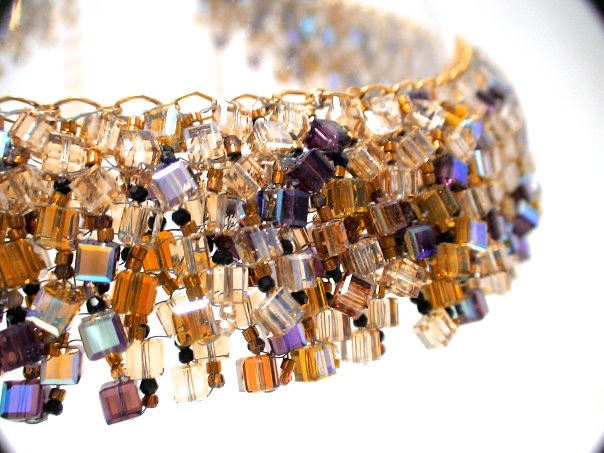 In essence, the finished piece of jewelry is an exemplar of the jewelry artisan’s vocabulary and grammar of design. The fluency in how the artist uses this vocabulary and grammar in designing their piece should be, I would think, especially correlated with the success and resonance of the piece. Often, artists implement their design element choices with attention and recognition to Principles of Construction. Principles of Construction are the rules or grammar for using design elements in a piece. Given the artist’s goals for beauty and function, the artist is free to apply the rules in any way she or he sees fit. 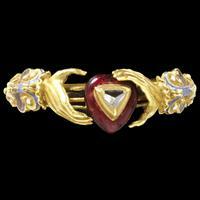 However, we expect to find this grammar underlaying all pieces of jewelry, whether the piece is contemporary or otherwise. When we want to apply the label “contemporary,” however, we search for the choices and logic the artist has used for constructing design elements into a contemporary whole, and in anticipation of our shared understandings. I suggest these 10 Principles of Construction. All Principles need to be applied, yet each is different from and somewhat independent of the others. For example, the colors may be well chosen, but proportions or placement not right. The jewelry designer brings perspective. The designer shows they can rise above the passions, inclinations and dominant opinions of the moment to do what their feelings, thoughts and reflections reveal to be best. And, at the same time, the designer shows that they can strive for a rapport, a sharing of values, an empathetic response, a type of respect deemed contemporary. If we return to our alphabet metaphor, it is necessary, but not sufficient, for the artist to assemble a palette of building blocks, thus, design elements. It is necessary, but not sufficient, for the artist to apply a vocabulary and grammar for arranging these building blocks, thus for constructing a piece of jewelry. Most importantly, however, it is both necessary and sufficient for the artist to anticipate how the piece of jewelry will be assessed prior to making any choice about design element or construction. The more coherent and aligned each aspect of this process is, the better managed. To the extent the artist can strategically manage this whole “backwards” design process, the more fluent in design that artist is. The more fluent in design, the more the finished piece reveals the artist’s hand and resonates. So, there is a very dynamic performance component to design. The contemporary jewelry designer needs to think about what criteria their client and the general culture and market will use as acceptable evidence of “contemporary” and “good contemporary design”, when the piece is introduced. The artist needs to think about things like connection, emotion, resonance, integrity, market. The designer needs answers to several questions at this point. What is the designer’s process and routine for thinking about shared understandings and evidence of authentic performance? How well have they anticipated these criteria of evaluation? Has the designer created a continual feedback loop so that acceptable evidence is introduced throughout the full process of design? To what extent will the eventual evaluation of the contemporary jewelry designer and their work be fair, valid, reliable, and a sufficient measure of their results? 1 Thinking Routines. I teach jewelry design. I find it useful to engage students with various ways of thinking out loud. They need to hear me think out loud about what choices I am making and what things I am considering when making those choices. They need to hear themselves think out loud so that they can develop strategies for getting more organized and strategic in dealing with information and making decisions. My inspiration here was based on the work done by Visible Thinking by Project Zero at Harvard Graduate School of Education . 2 Fluency. I took two graduate education courses in Literacy. The primary text we used was Literacy: Helping Students Construct Meaning by J. David Cooper, M. Robinson, J.A. Slansky and N. Kiger, 9th Edition, Cengage Learning, 2015. Even though the text was not about jewelry designing per se, it provides an excellent framework for understanding what fluency is all about, and how fluency with language develops over a period of years. I have relied on many of the ideas in the text to develop my own ideas about a disciplinary literacy for jewelry design. 3 Shared Understandings. In another graduate education class, the major text reviewed the differences between understanding and knowledge. The question was how to teach understanding. Worth the read to gain many insights about how to structure teaching to get sufficient understanding to enrich learning. Understanding by Design by Grant Wiggins and Jay McTighe, 2nd Edition, Association for Supervision and Curriculum Development, 2005. 4 Backwards Design. One of the big take-aways from Understanding by Design (see footnote 2) was the idea they introduced of “backwards design”. Their point is that you can better teach understanding if you anticipate the evidence others will use in their assessments of what you are trying to do. When coupled with ideas about teaching literacy and fluency (see footnote 1), you can begin to introduce ideas about managing the design process in a coherent and alignable way. In many circles “jewelry” is considered a craft. In others, “jewelry” is art. At the Victoria and Albert Museum in England, they have opened up their art collections to include those of craft. Yet they continue to make a distinction between the two, as seems to be common across Europe. Craft is what you do with your hands, and Art is what you do with your mind. I think in America, any distinctions between craft and art are starting to get very murky. I guess we tend to be much more democratic about things. I recently finished reading a book called SHARDS by Garth Clark on ceramic art. 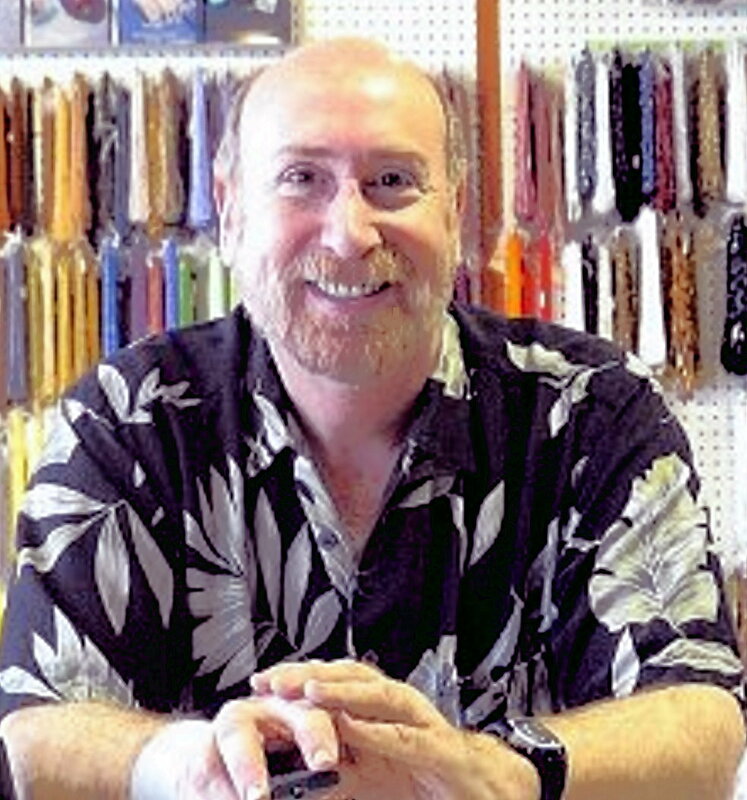 Clark’s is a major voice for understanding craft as art. But he decries the lack of leadership in the ceramics field in how ceramics are taught, and how ceramics are promoted. He feels that ceramics relies too much on an industrial model — making the best toilets, and not enough on an art model — making objects that resonate from an artist’s personality, sensibilities, and social/cultural perspectives. I wonder sometimes if there are not parallels in jewelry and beading to Clark’s assessments of ceramics. Another book I’ve just begun is THINKING THROUGH CRAFT by Glenn Adamson. He asks provocative questions about the marginalization of craft within modern art. He advocates for visual artists to take a renewed look at craft to better understand the “working in media” craft techniques and theories which also underly the visual arts, but are too often ignored. And just in time for our blog discussion on craft vs. art, I received this announcement from the Museum of Contemporary Craft in Portland, OR. Museum of Contemporary Craft, Pacific Northwest College of Art and panelists from Oregon’s creative community invite you to engage in a series of conversations about the anticipated integration of these two institutions. Explore the broader concepts relevant to creating a more vibrant and expanded organization that will strengthen its contribution to the cultural voice and economic vitality of the region. Conversations are moderated by Tim DuRoche, community program manager at Portland Center Stage. What Does Craft Mean To You? What Do You Think It Means To Others? How Does This Affect Jewely Making, Beadwork and Jewelry Design?